CES has certainly brought 2019 in with a bang, with all manner of PC components being announced and previewed over in Las Vegas last week. That said, we still have one last task to do before we can truly say adieu to 2018: crowning our Mod of the Year winners! It's wonderful to see that the three winners all hail from different disciplines, as it shows that talent and effort go a long way regardless of how you choose to construct your project. If you missed the announcement article, be sure to head on over there to have a look at all the builds that were nominated this year! First, though, we'd like to be transparent about some changes that were made to the selection process after the voting article went live. We hadn't quite anticipated the effect that platforms such as social media would have on the voting, with some peculiar results popping up occasionally. It's important to stress that posting up a vote request on social platforms is by no means against any rules, so nobody has been penalised and no votes were altered at all. Instead, we introduced a weighting from the judging panel, using a 50/50 split between public votes and panel votes for all prizes rather than just Overall Best Build of the Year. We feel this is fair; if one were to come first in the public voting, that would mean it's the equivalent of coming first in every single judge's ranking. I'd personally also like to thank each and every one of you who took part in some way in the modding scene here at bit-tech last year. It's always a pleasure seeing so many logs appearing on the forums, both from new members and old hands alike. This site is the reason I first got into modding as a hobby and later occupation; the idea that it could potentially continue to do the same for others is very heart warming, and it's entirely down to the community here. Some notable runners up this year were Lockdown by zulboy45, "Cryolab" benchtable by Y.G Casemod, Goa´uld Al´Kesh by ronny78, project METEOR by S.PiC and Reinhardt by twister7800gtx. You all came within a hair's breadth of the top spots; it was really quite an even fight this year! And here we are: the results for Overall Best Build of the Year, Case Mod of the Year, and Scratchbuild of the Year. As mentioned above, these were determined using a 50/50 split between public votes and the judging panel. This year the overall prize has gone to a scratchbuild, so the title of Scratchbuild of the Year passed down to the runner up for that particular category. It's fairly consistent that this title ends up in the hands of somebody who spent a while on their build. 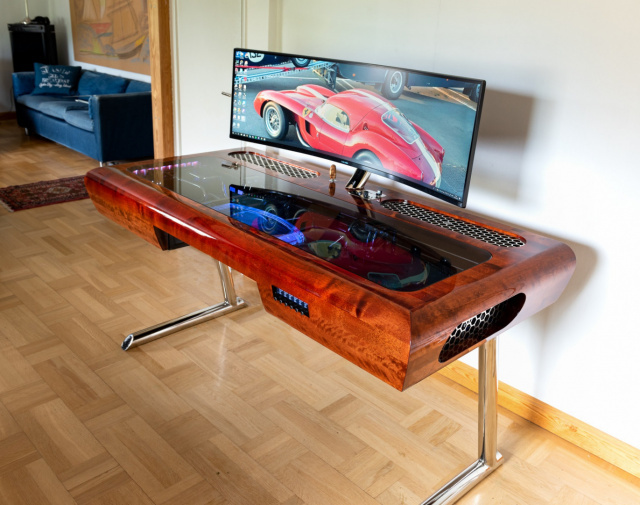 In the case of Mahogany Desk, it commenced on our forums back in February 2017, so almost two years in the making, and it shows. A dizzying array of techniques were used to bring this wood, metal, and glass creation to life. From the welded chassis through to the sculpted wooden panels, the project log is a tour de force of taking the right time to do something properly. If I had to pick out a favourite element, for me it would be the classic marriage of the French-polished mahogany with the polished metal frame and detailing. Congratulations! Ali is no stranger to modding success; his mods frequently make it into the Mod of the Month competitions here on bit-tech, and he's also used to snapping up wins in competitions from the likes of Cooler Master and Thermaltake. 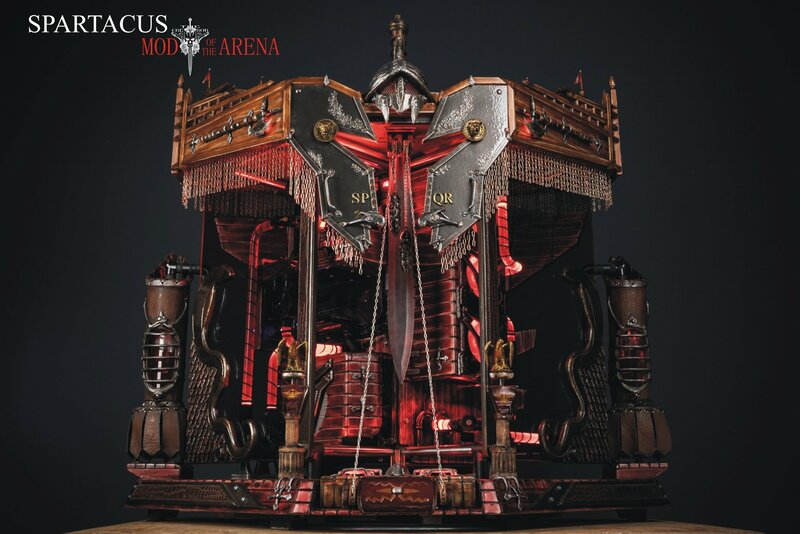 Spartacus actually began life as a competition entry in Thermaltake's MFC 2 contest. Ali took a Core P90 and went to town, sprucing it up with his signature aesthetic. Ali is a keen proponent of using hand-operated methods in competitions, heavily utilising wood, leather and paintwork in Spartacus. The detail work is astounding, with individual bricks in the structure all carved into the wooden surfaces and every inch of the mod telling a story. There's a real refinement to the mod, taking queues from the Colosseum and the classical gladiator aesthetic. From another familiar face on the bit-tech forums, AXE-R is as much a testament to rigorous planning and forethought as it is execution. It could very easily be confused for a production chassis, as the fit and finish are simply superb. 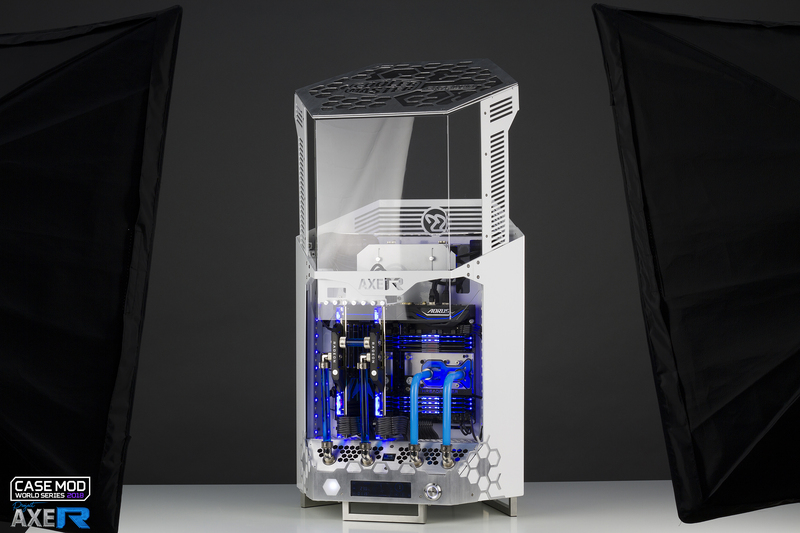 neSSa used a variety of precision machining methods alongside pure ingenuity to bring his Cooler Master World Series entry to fruition. The chassis is primarily comprised of laser-cut panelling, bent and fastened into place, and it sports an internal motorised system that allows the cover to raise at the push of a button. A dual loop water-cooling system completes the look of the build, accentuated by some superb photography to go with it.